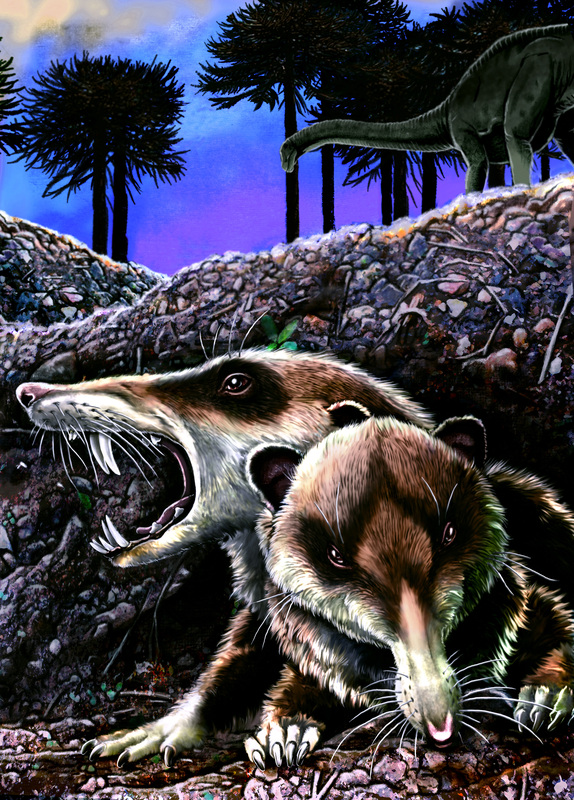 The charming little guys in the illustration above are the new best clue to what went on in mammalian evolution in the southern continents from 130 million years ago to 60 million years ago. Note what big teeth this insect-eater had. Nobody is sure just what they used those oversized canines for, unless Cretaceous-era insects put up a hell of a fight. Probably no more than 4- to 6-inches long, Cronopio dentiacutus was about the right size to hide from the dinosaurs, the dominant life in the neighborhood. A paper about the discovery of inch-long Cronopio skulls is published in the November 3 edition of Nature. University of Louisville researcher Guillermo W. Rougier, an expert in mammalian evolution, is the lead author. Rich Cifelli of the University of Oklahoma, who studies early mammals, called the skulls a “Rosetta Stone,” for mammalian evolution in the southern continents. Ninety-three million years ago, South America was just breaking up from the supercontinent Gondwana, the land mass that included Africa, India, Australia and Antarctica. During Cronopio’s lifetime, Earth was a toasty place, with no polar ice caps. Although the continents were south of where they sit today, and Africa and South America were separated by an ocean no bigger than the Mediterranean Sea, the land was tropical. The paper’s second author, Sebastian Apesteguia, discovered the Cronopio skulls embedded in rock in 2006. While the Argentine scientists worked to remove the skulls from the surrounding material, Rougier waited to see what emerged. An expert in mammalian evolution, Rougier has conducted field work in China, Mongolia, Japan, and elsewhere. When he saw photos of what was emerging in the Argentine laboratory, he was stunned. Rougier, who will be 47 on November 4, came to U of L in 1998 from the American Museum of Natural History in New York City. He grew up in Buenos Aires and dreamed of being a paleontologist since he was 7. Although his primary focus is on mammals, he has researched the origin of turtles, work featured on the cover of Science in 1996. His work on the origin of marsupials was on the cover of Nature in 1998. Rougier said the skulls are only a single data point in the long history of mammalian evolution. In pursuit of that picture, Rougier will return to Argentina early next year.